Demension: 55×68×20mm , Weight: 157g. The solid collar needle roller bearing has compact structure, small radial size and large load carrying capacity. It is suitable for the parts of which the radial overall size is limited. It is also wide applied to the situation where the shaft or housing has the swinging motion. In general, the needle roller bearing only withstands the radial load, not the axial load. When the shaft has axial load, it can be used in combination with other bearings. However, it does not limit the axial shift of shaft or housing. 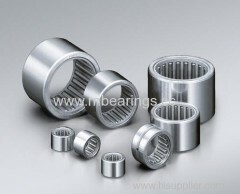 The limiting rotational speed of needle roller bearing is lower. In high rotational speed of main machine, the needle roller bearing with cage shall be chosen as far as possible. In compassion with other types of needle roller bearings, under the situation of same radial size, the needle roller bearing has the large load carrying capacity and high rigidity but has high friction torque. This kind of bearing has many series with different structure and size. It is requested that the hardness, processing accuracy and surface roughness of shaft journal surface and rolling surface of outer housing be same as those of the collar of bearing. As for the needle roller with G2 class, the diameter varies within 2µm in group. Except the full complement needle roller bearings, they have the rigid cages, which can correctly guide the parallel axis line of needle roller. The needle roller bearing without inner ring is suitable for the parts of which the radial size is limited. Because of no inner ring, the surface of shaft journal fitted with it is acted directly as rolling surface. It is rquested that the surface hardness be no less than HRC60, surface roughness, no more than 0.63µm. This kind of bearing does not limit the axial shift of shaft and housing and has high limiting rotational speed. The inner ring has no shoulder in this bearing. For this purpose, the inner ring, outer ring, complete set of needles and cage can be mounted respectively. This bearing does not limit the axial shift of shaft and outer housing. Since the cage separates the needles so as to reduce friction. It can be used for the parts with high rotational speed. Because of no inner ring, this needle roller bearing is suitable for parts of which the radial size is limited.The surface of shaft journal fitted with it is acted directly as rolling surface. It is requested that the surfacehardness of shaft journal be no less than HRC60 and the surface roughness Ra value, no more than 0.63µm.This kind of bearing does not limit the axial shift of shaft and housing. housing. Since the cage separates the needles so as to reduce friction. It can be used for the parts with high rotational speed.